CARLSBAD — New businesses open every year, but it’s rare to have one open its doors because someone’s child was their inspiration. This happened to Lucile Hooton Lynch. Lynch, whose son Connor was born with cerebral palsy, made the decision to park her legal career as a trial attorney and co-founded Steps4Kids, a production company that creates award-winning educational DVDs for children in pre-kindergarten up to elementary school. The instructional videos set kids up for success in areas such as learning the alphabet, math, writing, drawing and much more. Lynch, also the owner of Steps4Kids, lives in Carlsbad with her family and calls Connor her miracle baby. Connor was given less than a 5 percent chance to live. Now, he is 14 years old. Lynch credits her son for being one of the toughest little guys she knows. 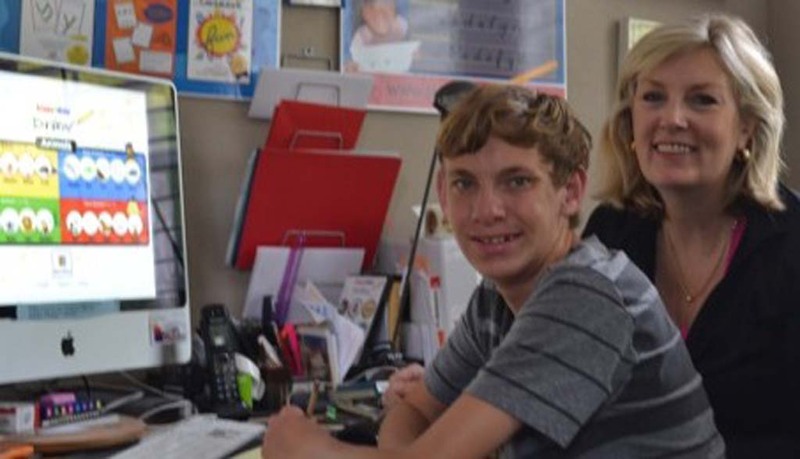 As Connor grew older, his cerebral palsy and focus issues affected his writing skills. Because he enjoyed television, Lynch got the idea of using it as part of his learning tool. Her first homemade video popped up in late 2004. Lynch researched video modeling and discovered how it helped with learning and retention. “I filmed myself writing letters using the ‘point of view’ perspective,” she said, adding that she tried a few letters and her son grasped it. Lynch then did the whole alphabet. While Conner watched the DVD and practiced his letters, she didn’t expect her other twin son, Chase, to do the same. Eventually, Chase did so well he earned a handwriting award at school. Following that, Lynch made more homemade DVDs in areas such as spelling, reading, how to make the bed, and so on. The spelling DVD is Connor’s favorite. “For example for the word ‘catch,’ I filmed him and his brother throwing the ball back and forth five times as they spelled the letters to help visually demonstrate the word as well as teach the word using auditory support,” she said. When Lynch discovered that both her sons were benefiting from the DVDs, that’s when the idea of a business percolated. Her DVDs could help developing children and those with special needs. Steps4Kids, based in Encinitas, opened in 2005. Lynch taught herself how to use a camera, graphics, film editing software and website coding. Her support network included her husband, sons and mother. Now, her products are sold in the U.S., Canada and Singapore. Steps4Kids has also received numerous awards from Creative Child Magazine, Dr. Toy, Booklist Online and more. Its most recent accolade was “DVD of the Year” for its Steps4Kids to Draw by Creative Child Magazine.